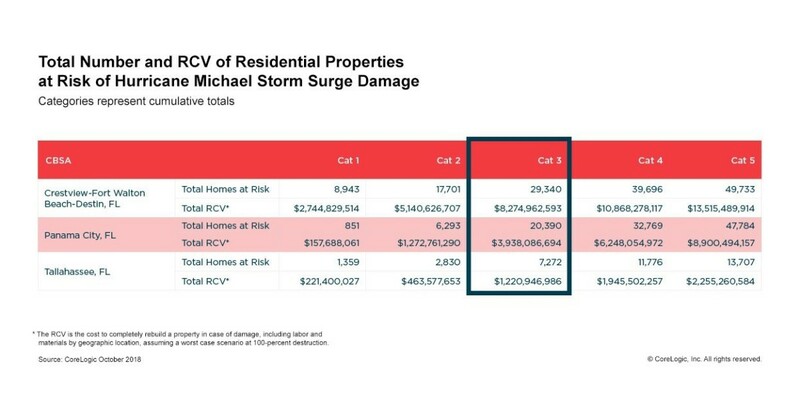 IRVINE, Calif.–(BUSINESS WIRE)–CoreLogic® (NYSE: CLGX), a leading global property information, analytics and data-enabled solutions provider, today released data analysis showing 57,002 homes in the Florida Gulf Coast with a reconstruction cost value (RCV) of approximately $13.4 billion are at potential risk of storm surge damage from Hurricane Michael based on its projected Category 3 status at landfall. The storm’s size and path could change over the coming days, so to keep parties informed, CoreLogic will be hosting a pre-landfall webinar on October 10 at 12:30 p.m. ET with updated figures to reflect Hurricane Michael’s changing path and intensity.